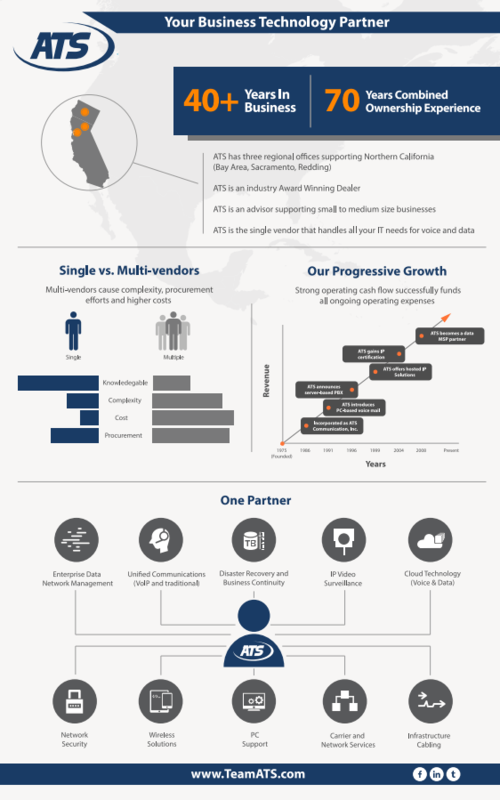 ATS is the single vendor that handles all your IT needs for voice and data. At ATS, we understand that there is no "one-size-fits-all" solution when it comes to business voice communication solutions. We offer a variety of VoIP and mobile voice solutions that can either replace or work with your existing systems. ATS has built an outstanding reputation by providing top quality support to each customer on a routine basis. At ATS, we are a proactive outsourcing partner that can suggest meaningful improvements in business processes, and share best practices. We can help establish goals that focus on how improved IT services delivery can result in better business value. We ensure that the right processes and technology are implemented in order to achieve your businesses goals. Thus, helping you achieve higher productivity and profitability. ATS has gained a reputation of providing exceptional service for our customers.